The Consumer Price Index increased by +0.2% in August on seasonally adjusted basis as compared to the expected increase of +0.3% by the market, matching the increase for July 2018. The Core CPI – excluding food and energy -0 increased by +0.1%, the smallest increase since April 2018. In July the Core CPI increased by +0.2%. The Fig. 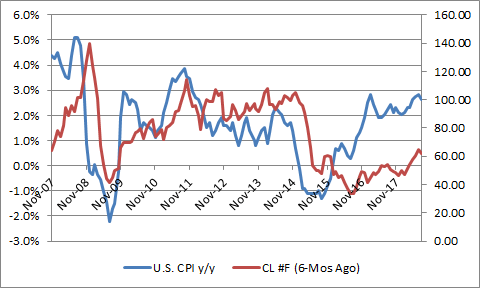 1 depicts the CPI year-over-year change with a six-month lagging Crude oil and Copper price combo using December 2006 as base (or indexed). To a large extent, these two are correlated. The increases for shelter and energy were the main contributors to the CPI increase. Th energy increase by1.9% due to a 3.0% increase in the gasoline index. The shelter rose by +0.3%, same as that in July. The food index rose marginally with the index for food at home unchanged. The airline fares and used cars and truck prices increased in August. Apparel, medical care, communication, recreation and personal care prices fell. For the 12-month, the CPI increased by 2.7%, smaller that 2.9% increase in July. The core CPI rose by 2.2% lower than 2.3% in July. The energy index rose by 10.2% for the past 12-month, also lower than in July. The year-over-year food index increased by 1.4% in August as compared to that in July. The inflation expectations are rising. The 5-Year, 5-Year Forward Inflation Expectation Rate, 10-Year Breakeven Inflation Rate and 5-Year Breakeven Inflation Rate have been rising since late 2016 and are at the highest level since October 2014 (see Fig. 2). 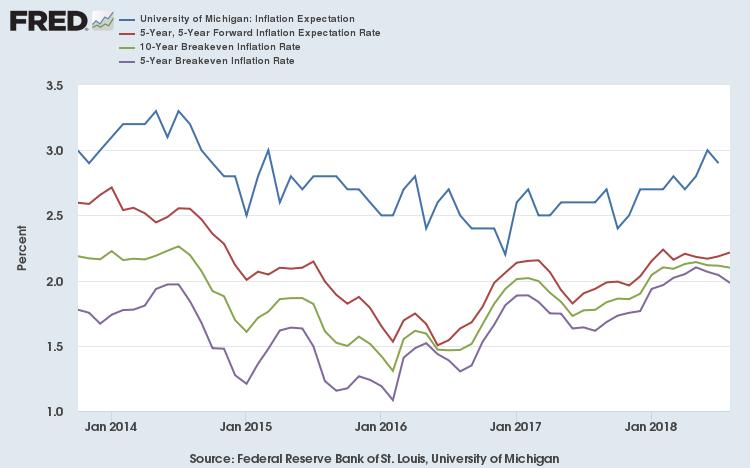 The University of Michigan Inflation Expectation is at mostly rising since December 2016 and is at 2.9%.